Council Member Donovan Richards stood on the steps of City Hall this morning, asking DOT to move ahead with full-fledged Bus Rapid Transit on Woodhaven Boulevard and Cross Bay Boulevard. Six other Queens council members have joined Richards on a letter to DOT and the MTA asking for center-running bus lanes, station-like bus shelters, and pedestrian safety improvements. In addition to Richards, council members Eric Ulrich, Elizabeth Crowley, Karen Koslowitz, Julissa Ferreras, Daniel Dromm, and Jimmy Van Bramer — whose districts all include the potential BRT route — want DOT and the MTA to “consider implementing full-featured Bus Rapid Transit” on Woodhaven [PDF]. 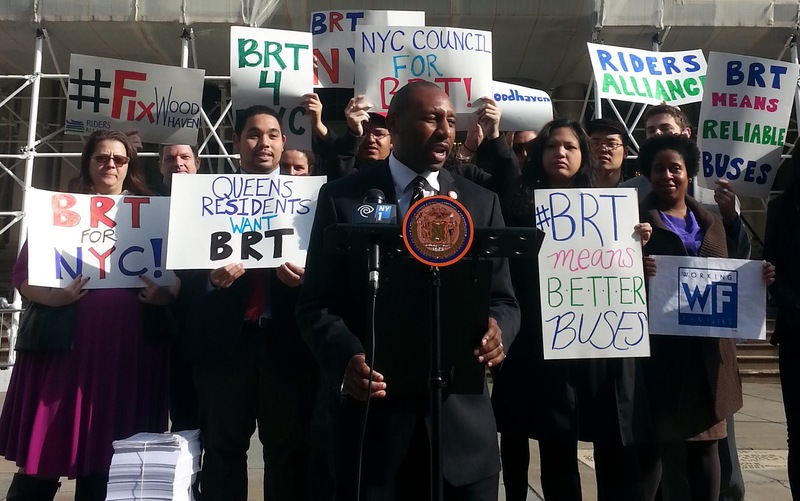 There is now a united front of support for BRT from city elected officials in advance of the anticipated rollout of a bus improvement plan from DOT and MTA this fall. “Part of the reason many people drive in these communities is just poor transportation. I think this is a huge step in the right direction, and I think people will leave their cars at home more often,” Richards said. He noted that many of his constituents can’t afford private cars, and already rely on bus service. The BRT for NYC coalition, which includes major business, labor, and transit groups, is continuing its work to build support for bus rapid transit. Next up for them: Securing backing from more elected officials and adding more groups to the coalition’s membership. The complete phase two proposal from DOT and the MTA for Woodhaven is expected this fall. This post has been updated to more accurately reflect the views of Assembly Member Phil Goldfeder. Well ya, it makes sense to have a brt on Woodhaven boulevard. I alway felt sorry for the folk that live by there with their lack of easy access to the subways. Unbelievable how we have to fight for real BRT in a city where most people don’t even drive. Rail reactivation and surface transit improvements on Woodhaven should be tied together and sold as one package for the entire city. Both are useful projects in their own right, but each has distinct advantages. They don’t even step on each other in any way. Councilman Richards hit the nail on the head–tens of thousands of New Yorkers who live along Woodhaven can’t afford to get around by car. The roadway needs to be reallocated in a way that reflects that reality. Increasing service frequency and reducing travel times will change behaviors, enticing drivers to leave their cars at home if it is quicker and less stressful to take mass transit. No they really shouldn’t be tied together because they are quite different and the cost difference and likelihood of implementation is vastly different. A BRT system, while certainly not cheap given the construction needed to create a center Boulevard bus-way, would be a fraction of the cost to build a new train line [there is nothing to “reactivate,” you have to build from scratch]. Also, the equipment costs are much less expensive for the BRT, the facilities needed to house the new division are cheaper and the routing is much easier, able to use existing roads to reach meaningful final destination without having to figure out how to link to either the subway [by tunneling under Rego Park] or connecting to the LIRR mainline, both options are already over subscribed. Then you get to the problem that MTA has no interest in building a new rail line in that area. It has several multi-billion dollar projects either already underway or on the drawing boards way ahead of any new train line and has not included building a rail line in its 20-year or other planning documents. So with respect to Stephen, when he says the idea is “gaining steam” all he really is describing is that train activists have gotten louder in response to an amazing linear park and bikeway proposal that truly is feasible in the short term. The MTA isn’t considering it, other electeds, Karen Koslowitz for instance, have flat out said they will fight it, so train isn’t happening. On the other hand the QueensWay can be built in the relatively near future for a small fraction of the cost of the train idea and will include a 3.5 mile bikeway that would add to the transportation mix in that region [which has absolutely zero bike infrastructure] and complement a BRT very well. BRT should not be made hostage to a rail idea that does not have broad support outside of Goldfeder and his train friends, and which the MTA certainly has no interest in doing for at least the next several decades. BRT construction on something like Woodhaven should be very cheap because little new infrastructure is needed. Actually, it should cut operating costs over the present bus system, and may even help pay for itself in savings. OTOH, BRT is only cheaper than rail if ignore long-term operating costs. Over 30 years, rail is significantly cheaper. The MTA isn’t really considering anything. It does what it’s told and paid to do. The kicker is the price of the park exceeds reasonable rail reactivation costs. And Goldfeder is nobody’s friend here. He doesn’t care about rail, he just wants to keep lanes open to cars on Woodhaven. Where did you get the idea that the train is cheaper? Just buying the train sets would be more expensive than the park. And that is before you rebuild the eroded right of way to carry heavy trains, lay track, build electrical substations, build passenger stations, build yard/maintenance facility fir the new division, build a new trestle over Jamaica bay, probably have to replace 6-7 restless along the way. And if you will connect to thesubwaythen you have to dig a .75 mile tunnel under Rego Park. Even without the tunnel you are not getting away with this for less than $1 billion. I think your imagination is running a bit wild about costs here. Most of the rail bed replacement stuff you mentioned was done a few years ago in New Jersey for around $6M/mile;if you want to triple that, to be incredibly generous to your claims about having to replace everything including several trestles, you still don’t approach reactivation costs of $120M by a long shot. I don’t even know what you mean about Jamaica Bay, since that part is already active. Anyway, given the service gap such a service closes on the subway, it would be well worth a billion. But it just doesn’t need to be that expensive because we have a ROW already. As for train sets, it depends on service levels/patterns, but perhaps a good rule of thumb now is $7 million per 5-car set. The same amount of vehicle capacity in bus form would have similar upfront vehicle costs. Not rail bed replacement, but rail bed construction. Have you ever been up there? And the train sets cost quite a bit more. Current 8 car M7 train sets are $18million and the newer cars are even more expensive. And the electrical infrastucture also has to be built from scratch. In fact surface extensions of BART and the DC Metro out to Dulles cost $251 million/mile and $268 million/mile respectively. Even light rail can run upwards of $100-200 million/mile. Rail bed replacement means removing the previous railbed and…replacing it (i.e., constructing a new one). If there is none, even better. The M7 is a much bigger, heavier piece of equipment used on mainline rail lines. I don’t know why you’d bring it up when you can simply look at a car order NYCTA is making or made recently, but that’s actually not even that out of proportion to what I said. Double the number I cited, which was basically the R160 costs adjusted for inflation, and consider that $14M 10-car train is probably smaller than an 8-car M7 set. Whatever additional equipment NYCTA needs to operate Rockaway Line, if any, is probably a rounding error on the next nine- or ten-figure car order. Neither of the construction examples you cite are, to my knowledge, exclusively at-grade or on existing ROWs that are public owned. Both appear to involve expensive land acquisition, and certainly the Dulles extension involves lots of grade separation. As are many projects in NYC, WMATA is overbuilding of course. If it is to be LIRR service they are running M7, 8 and now M9 which are quite expensive. If you are making this a new subway line then you either have to tunnel under Rego Park and that by itself wil make the cost sky high, or you need to build many more miles of track along the LIRR mainline out to the Sunnyside yards and then where? Which also adds to the cost significantly. Anyway, this debate is pointless as MTA doesn’t have any interest in building a train line there. There is some provision under Rego Park for the subway connection, though I can’t find any exact documentation of its extent. Since it wouldn’t involve stations, claims that it would be “sky high” are rather dubious. 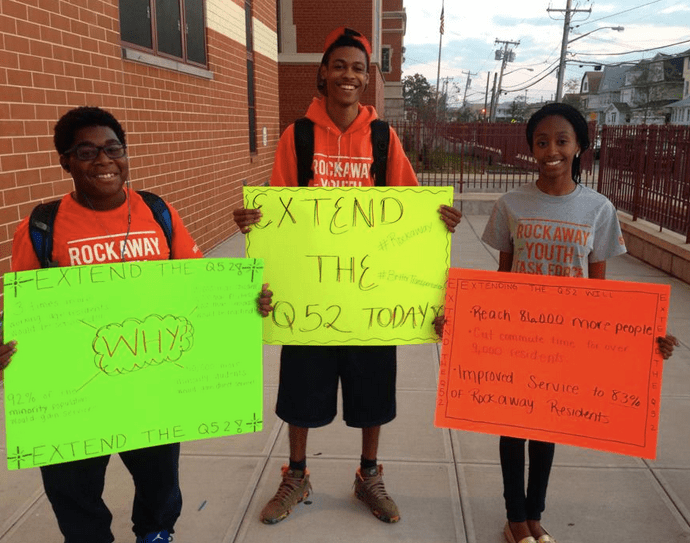 Actually, the MTA has shown more interest in Rockaway reactivation than it has in any other system expansion. That is to say, more-than-none. But they don’t take initiative on their own period, so if you want to take that tack any discussion about any transit expansion must be pointless. … there is an unfinished signal tower on the Jamaica-bound (railroad north) platform and a bellmouth that diverges to the south from the local track. Another bellmouth from the Manhattan-bound local track diverges north, then curves south above the Queens Boulevard Line to join the other bellmouth. These were provisions for a planned expansion in the 1930s that would have connected with the IND Rockaway Line towards Howard Beach and the Rockaways. My best guess is that would mean having to condemn from housing between Queens Blvd. and the Rockaway Line to tunnel. I guess that could conceivably reach into the eight figures. But I can’t see how cloth those bellmouths actually.